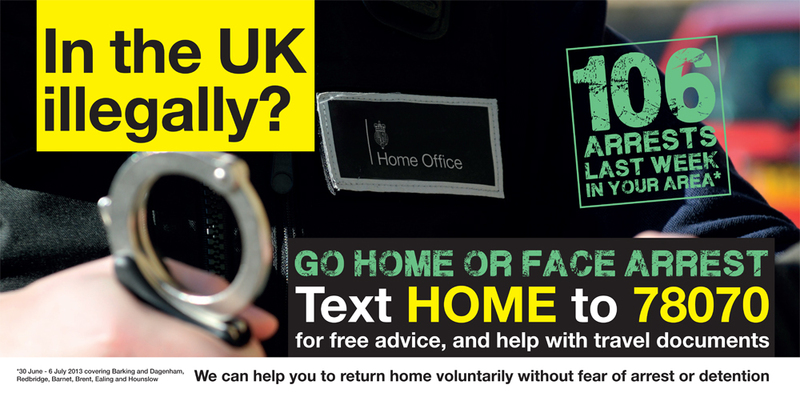 The Home Office's "go home or face arrest" billboard has been banned after the ad watchdog upheld complaints that it was misleading. However, the ad watchdog did not uphold complaints that the use of the phrase "go home" was offensive for being reminiscent of slogans used by racist groups in the past, or that it was irresponsible and could incite racial hatred. The Advertising Standards Authority received 224 complaints about a Home Office ad displayed on vans that travelled around Barking and Dagenham, Redbridge, Barnet, Brent, Ealing and Hounslow as part of a two-week pilot this summer. Respondents challenged whether the claim that there were "106 arrests last week in your area" could be substantiated and also whether qualification in the small print was presented clearly. The ASA upheld both sets of concerns. As the 106 arrests figure did not refer to the actual areas where the poster was shown, but to a large area of London north of the river Thames, the ASA found the claim was misleading and had not been substantiated. The ASA ruled the small print relating to the arrests that read: "30 June - 6 July 2013 covering Barking and Dagenham, Redbridge, Barnet, Brent, Ealing and Hounslow", was misleading because of the limited about of time people would be able to see it on a moving vehicle and also because of its small prominence compared to other information on the poster. The complaints came from individuals as well as groups representing migrants, legal academics and the Labour peer Lord Lipsey. 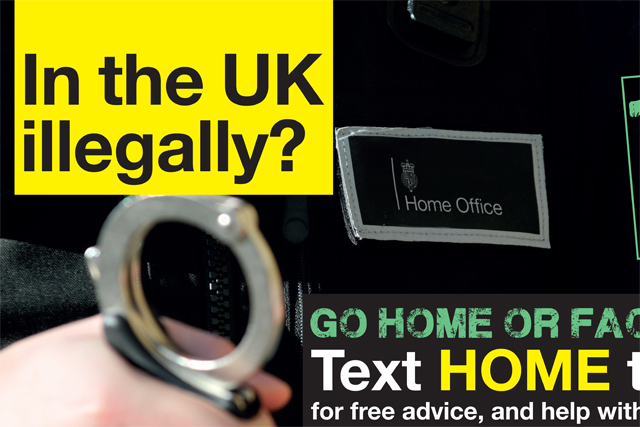 Although the ASA recognized some people might find the "go home" phrase" distasteful in the context of an ad addressed to illegal immigrants, it ruled unlikely to cause serious or widespread offence or distress. Moreover, the watchdog found that as the poster was referring to illegal immigrants’ immigration status, rather than their race or ethnicity, it was unlikely to incite or exacerbate racial hatred and tensions in multicultural communities. The ASA launched an investigation into the ad in August.